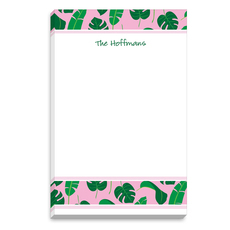 This set of personalized flat note cards provides a tropical setting for every note you write. Size 6.25" x 4.625". Flat printed in ink color as shown with your choice of typestyle. Blank white envelopes included. Printed return address in flat black ink available. Design and positioning only as shown.